It's still a while before my book The Sustainable Baby comes out (sometime in July next year), but the first milestone has been achieved. I finished the manuscript and it's in the editor's hands! It feels pretty good. The next great thing is that the manuscript editor actually lives here in the same village - I'm pretty excited to meet her. I think this kind of book is way overdue - I wish there was something like it when I had T. How to fold cloth nappies; how to make baby cereal; how to build homemade toys; how to stretch a tight budget to still be able to give a child the richest possible world, surrounded by beautiful things. 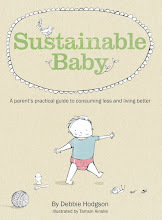 The subtitle is A Parent's Practical Guide to Consuming Less, and Living Better. Hope it lives up to all that! I stumbled on your book at my local library (which normally never has any good books) and as soon as our IVF works (we start next month) I plan to get my own copy. I read it cover to cover twice before I returned it and found everything so doable. It was like the sort of advice I wish my mother would be able to give me - rather than the "I did it this way when you were a baby" nagging I suspect I am in for.